I hope you enjoyed your weekend … a holiday weekend for some of you! Our fireworks were a bit on the fence as storms blew threw around 6 pm. A bit delayed but fireworks non-the less! I had a fairly quiet weekend, mostly stamping and doing some upcoming classes planning. Today I’d like to share with you an absolutely amazing opportunity. During the month of July, Stampin’ Up! is giving all new demonstrators (don’t let that word scare you) a FREE gift! They are giving everyone who purchases the Starter Kit a FREE color family of the New Ink Pads!! Your choice of course! That is a $67.50 FREE and is over and above the $125 worth of product you get to choose for only $99. Shipping is FREE too so you’re saving another 10%. This is just the beginning of the amazing deals … you’ll be astonished at the doors that open when you choose to join the Stampin’ Up! & Stars family. There are pre-orders, like the upcoming Holiday Catalog available for us to purchase in August, Sneak peeks, free catalogs, access to exclusive stampin’ websites & blogs to name a few perks! 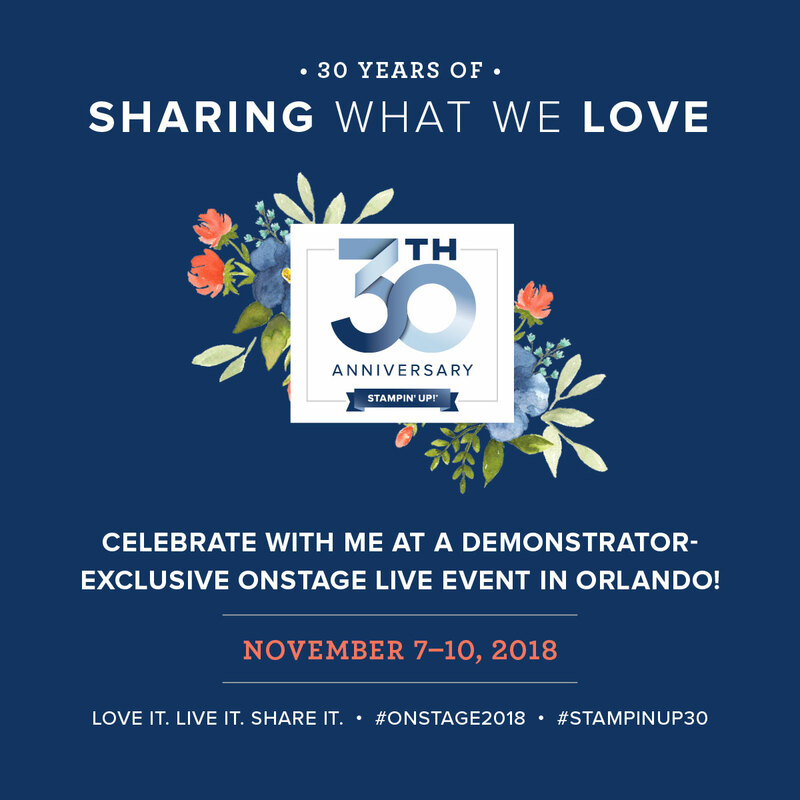 Why I think NOW is the perfect time ….I want YOU to come celebrate Stampin’ Up!s 30th Anniversary with me, my Stars group and Stampin’ Up! in Orlando, Florida this November!! This is going to be the biggest party of the year!! And it is exclusive to demonstrators. I plan on going a few days early to enjoy the sights. Many demonstrators plan their family vacations around these events. LET’S CHAT . . . Right Now for only $99 your entire kit is valued at over $200!! (That’s a 50% Savings!) You can contact me at … 262-334-1009 or email: lindaluvs2stamp@aol.com or just message me below and I will contact you to answer any questions or concerns that you may have. AND after you join, I will be here to help guide you so you can get the maximum benefits that Stampin’ Up! demonstrators enjoy! THANK YOU for taking the time to review the entire blog, If you’re already love the product and are buying it anyway, why not try out the benefits &, savings … you may be surprised!! It’s my 18th year! !